Idealistic "True Believers" who advocate Democrat Socialism are unable to reach valid conclusions. It is one thing to seek social improvement and quite a different fantasy that wants to save the world. The New members of the 116th Congress, especially Democrats are spreading the mindset that Bernie Sanders promoted in the 2016 presidential primary. While many pundits have exposed the destructive effects of Socialism, very few have been willing to challenge the sacred cow of Democracy. "While Democrats have become experts at using protected classes as pawns in their game of socialist chess, their plans go far beyond simple fairness. 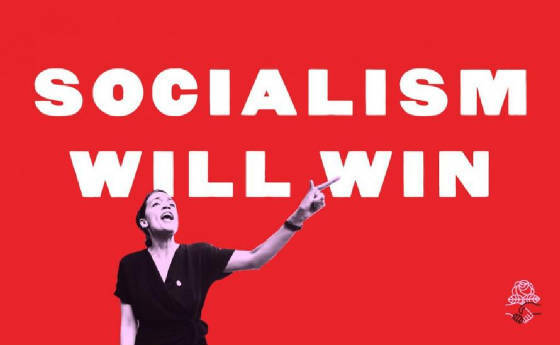 Democrats want to wipe out capitalism to create a Democratic Socialist utopia, bringing us closer to becoming the United Socialist States of America. The next two years look to be a boon for lovers of socialism, and could usher in the dystopian America Ayn Rand wrote about in her book, Atlas Shrugged." How far this nation has fallen from a philosophy of Liberty and actual economic achievement, into a society of entitlements rationalized upon imaginary privileges and artificially manufactured human rights, is frightening. The economic illiteracy which is the hallmark of expanding that "Free Lunch" which the producing class is required to pay for, only accentuates the demands of the underclass. "The Democratic Party exhibits all the symptoms of terminal lucidity. Sometimes called “the end-of-life rally,” this phenomenon involves temporary bursts of physical and mental activity in terminally ill patients immediately prior to death. It can cruelly mislead family members, who unrealistically take the apparent improvement as a sign that there is hope after all. This is how the left has responded to Democratic gains in the recent midterms. But such episodes rarely indicate any real change in the patient’s underlying condition, and the Democratic Party remains infected by fatal strains of Trump Derangement Syndrome (TDS), utopian socialist fantasies, and identity politics." This lesson has been hard learned by conservatives who labor in the trenches of politics. The AOC twitter crowd cheers their commitment and delight in their "so called" moral superiority. Notwithstanding such folly, these inept and poorly educated mental cripples are being used by the very establishment they rail against. The oligarchy that composes the sinister criminal establishment wants an ideological civil war and the Democratic Socialists are eager and willing to play into the hands of the tyrants. Today's breed of Democratic Socialists aspires to become a modern day version of Emma Goldman. They often are closet anarchists but always share a latent communistic nihilism. While not all individual topics should be deemed as progressive, the purported solutions provided fail to offer meaningful or realistic restructuring. Items such as criminal reform/end private prisons, campaign reorganization and restoring Glass-Steagall can and should be legislated. Even paleo-conservatives would agree with an end to an internationalist foreign policy, but to believe that the military-industrialist-security complex can be eliminated by a Congressional vote or that a peoples' movement could create a peace economy, is bush-league in sophistication. Until the focus is placed upon the alliance of elites, no matter what their public ideology image; the collectivism of the federal government will continue to administer a socialist society. The popular culture needs to admit that the beltway sycophants have a direct and personal interest in keeping socialism alive. Maintaining public dependency on government for financial existence is a fool's game. Yet, the misguided social media generation is so wrapped up into the high tech version of reality that they never took the time to learn the lessons of history and government betrayal that every 1960's radical understood.